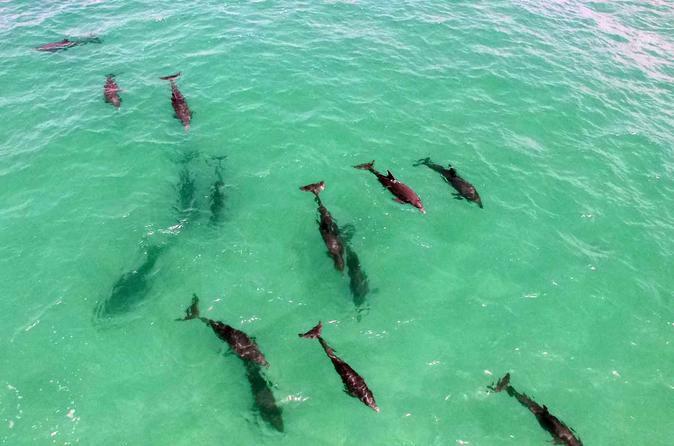 Enjoy dolphin watching, snorkeling, and sightseeing on a four hour open charter in Historic Key West! Learn about the history of the Florida Keys, the Southernmost Point of the U.S., with live commentary from an experienced Captain. Get personalized attention within a small group, limited to just six (6) passengers. Bring your sunglasses, towel, snacks, and other things you'd take to the beach. Arrive at the slip 15 minutes before departure time. Before heading out, your Captain will give a short safety briefing. Your drinks and snacks will be stowed in coolers with ice and complimentary bottled water. Then, you'll be ready for your Dolphin and Snorkeling Tour. As your Captain cruises out of the Key West Historic Seaport, you'll see private yachts of the rich and famous in the marina. This will be your first peek at Key West from the water, with all the yachts anchored off shore and where many of the Sailors stop for periods of time as they travel to and from the Caribbean. When we make the turn out of the harbor, you'll feel the cool ocean breeze as you leave the busy harbor behind. You'll head out past Sunset Key, a place with a very interesting history - be sure to ask your Captain all about it. Depending on weather, we either head out to the reef to go snorkeling or one of the many other snorkeling locations. Destinations are chosen based on the current weather conditions to give you the best visibility and overall experience. Once anchored, we'll provide a mask, snorkel, and fins to start your underwater adventure. Life jackets and noodle floats are also provided. After getting safely back on board, we’ll continue on to find some of Key West's famous Atlantic Bottle Nose Dolphin. No two trips are exactly the same; sometimes we will find the Dolphin first, and then go snorkeling. Throughout the trip, your Captain will entertain you with local history and facts about Key West - the Southernmost Point of the U.S. At the end of your Charter, you'll return to our centrally located slip at the Historic Seaport. You'll be right in the heart of Old Town Key West, steps away from so much more to do and explore!